Here are some pictures of my home foundry. Here is a picture of my furnace. It's made from a 5 quart pot that I got from Wal Mart. It's based on the one that I saw on the "Fun with molten metal" web page. 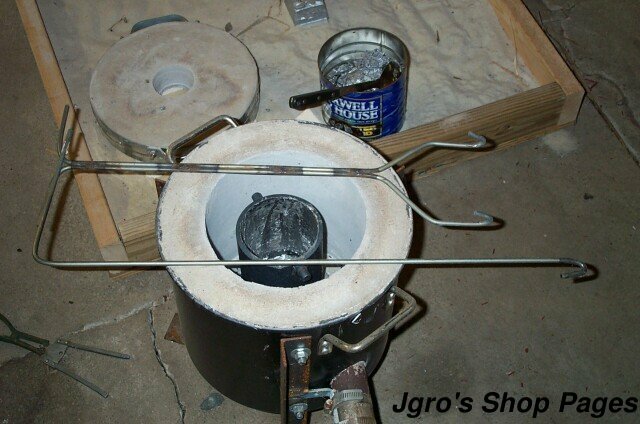 The burner runs on propane and is designed after one I saw on Ron Reil's web page. 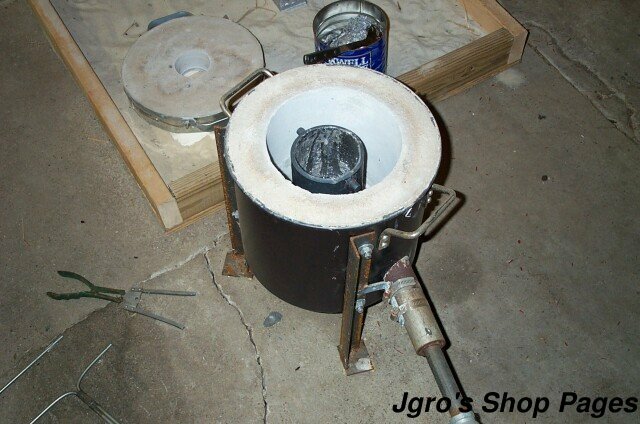 I use a piece of 6" diameter pipe with a 1/4" thick plate welded on the bottom for my crucible. The next image is of my lifting and tilting tongs. They are made from 1/4" diameter steel rod that has been formed and welded. 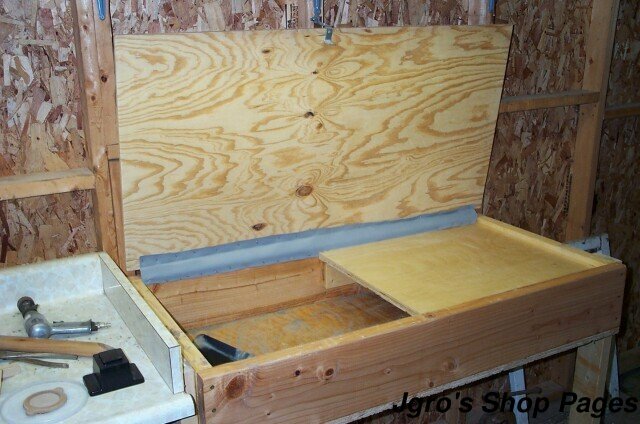 This is my molding bench. It's made from plywood and 2x8's. It's bolted to the wall and has two legs in the front. The plywood ramming surface on the right side is removable to help with cleanup of the sand. 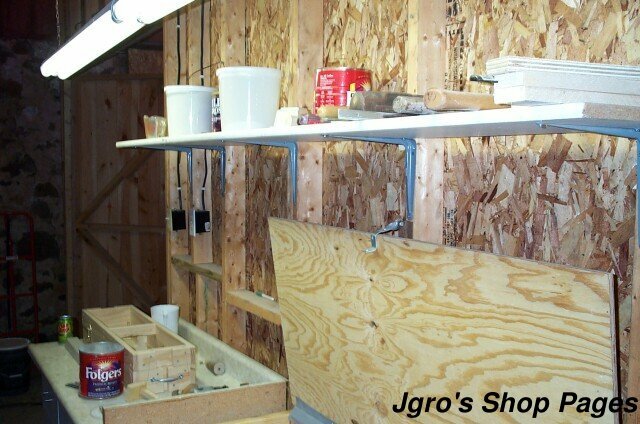 Above my molding bench is a shelf where all of my tools are within easy reach when I'm ramming up a mold. This is my pouring area. It's made from 2x4's and has a plywood bottom. It's filled about 3" thick with sand to contain any accidental spills. 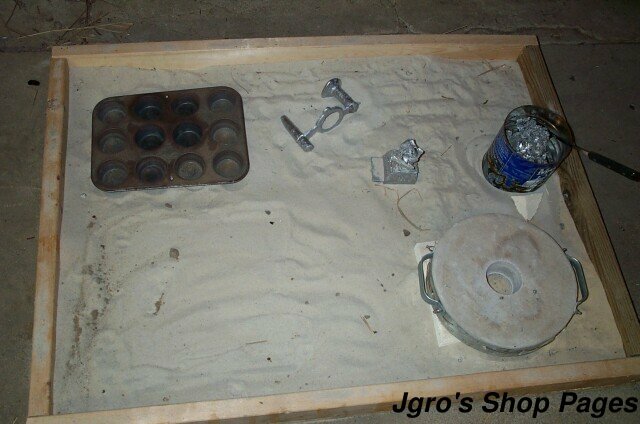 The muffin tin in the upper left corner is for making ingots. The next image is of some of the tools that I use for making runners and sprues. From left to right: a trowel, a piece of electrical conduit, a spoon, and two mason's tuck pointing tools.